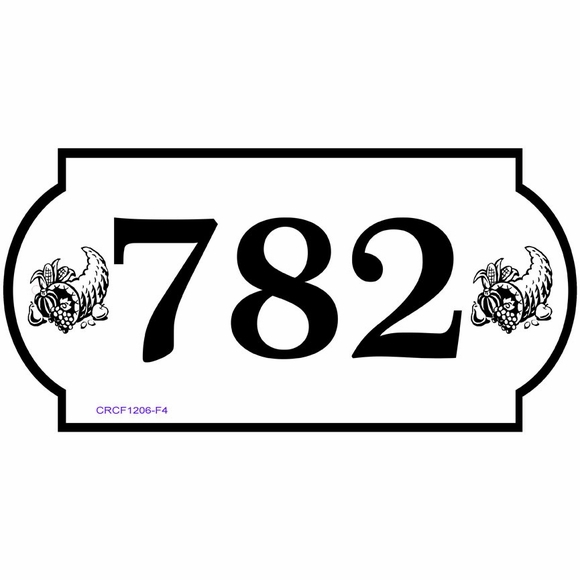 Personalized Horn of Plenty Address Sign - - 12" x 6" street number sign. Wall mount. The enhanced rectangle shape includes two engraved horn of plenty accents and a three-number address. Made in USA. Customized with your choice of color, the numbers you specify, and the horn of plenty or a fruit listed in the accent image selection box: apples, grapes, pear, pineapple, cherry,or strawberry. Click small image on the right end to enlarge the fruit selection chart. Characters, accent design, and border are permanently engraved into the sign during the production process. Holds up to three (3) 3.5" numbers on one line. Note: the style number in the lower left on the sample signs is for internal use only and is not engraved into your custom sign. Dimensions: 6"W x 2"H x 1/8". Laminated acrylic one line address plaque crafted in the USA by skilled artisans to assure the highest quality.